A Puzzle PVP game. Play with friends or AI! Toriko's playing board is 10 rows by 6 columns. ​The basic mechanic of this game is very easy. Swipe up (throw) to put back the birds on the board. Match at least 3 birds to clear. ​The goal is to clear as many birds as fast as possible. 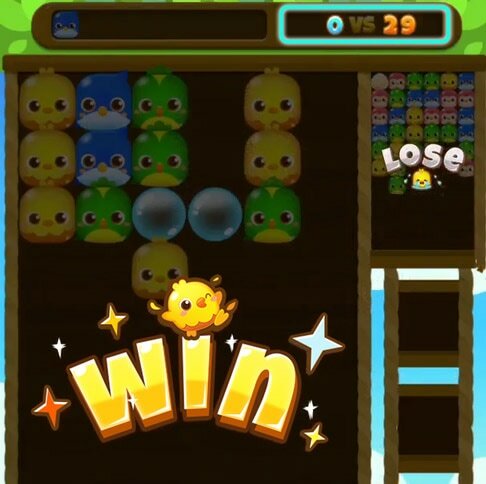 ✔︎ At least 3 birds must match vertically in order to be cleared. ✔︎ If you successfully match birds upwards, all birds of same color that's joined to the match will also clear. ​╳ They cannot be cleared sideways. ╳ They cannot be cleared in any other shape. In Toriko, you will be fighting in real time with another player. At the top left of the screen is the Bird Tray. Birds you pulled will be collected here. Beside that is the Quota. This is the number you need to clear to win. 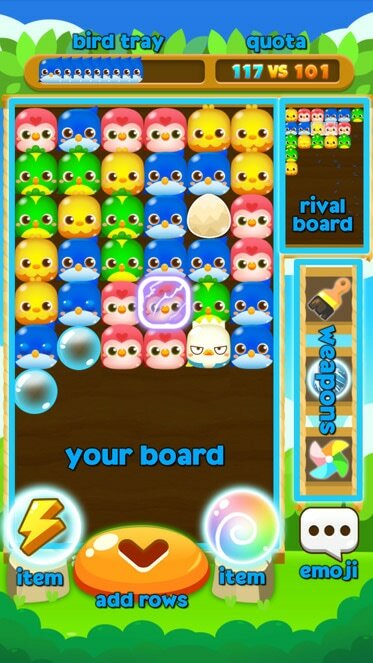 The small screen to the right is your rival's board. You can equip and use 2 Items at the bottom of your board to save yourself or get that edge over your rival. Below your rival board, you can equip and use 3 Weapons. It directly attacks your rival with new waves or other effects in real time. Press the Speech Bubble to send Emoticons to your rival. Match on Eggs to hatch them into the color you matched them with. Match on Electro Bird to clear all birds with the same color. Match anything on Frozen Birds and all ice blocks will shatter. Pull and throw Bubbles to burst. Poke column to burst Bubbles with any action. One very important concept in this game is Chain Combo. When you match a lot of birds quickly in succession, you will create Combos. 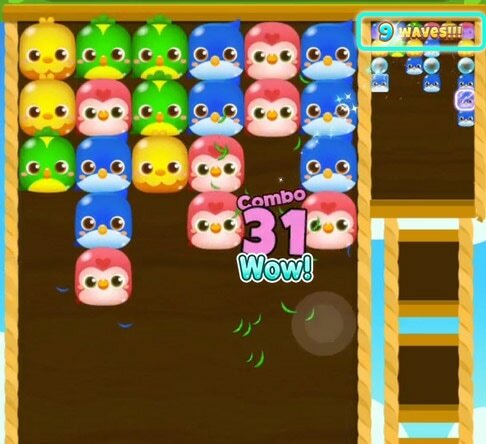 ​Combos will automatically generate waves that attacks your rival's board with new bird rows! The blocks used for the new rows can be customised at Lv 5. This is explained further in the WAVE ATTACK PATTERN section. There are two ways to win in this game. ​There are three Game Modes you can play in Toriko. At the end of every battle, you will earn EXP and Feathers. ​In Training mode, you will fight an AI computer. The AI's speed, reaction and wit will get stronger according to your skill level, so it's the best place for you to train up your skills. Try to win the strongest Level 10 AI! Tap PVP Battle to play with anyone around the world. If you win consecutively (get win streaks), there's a chance you can be listed in the LEADERBOARD. Fight with anyone to rank on leaderboard! You can equip 3 types of things in your inventory to bring into battle: items, weapons, and emoticons. Some equipments need to be unlocked by special criteria like reaching a certain level or having enough Feathers (currency) . You'll find out as you play. You can only equip and use 2 unique items per battle. Once used, you won't able able to use them again in battle. Be very careful when exactly you use them! Inventory items can help you get that edge over your rival when clearing quota. It can also save your life in emergency when your rival starts doing Chain Combos. You can equip 3 different weapons to use in Battle.​ Once used, you won't able able to use them again in battle. Be very careful when exactly you use them! Emoticons are animated emojis that you can send to your rival during a match. You can send as many emoji as you like, but don't let that stop you from winning! You can rank on the leaderboard by playing PVP Battles. 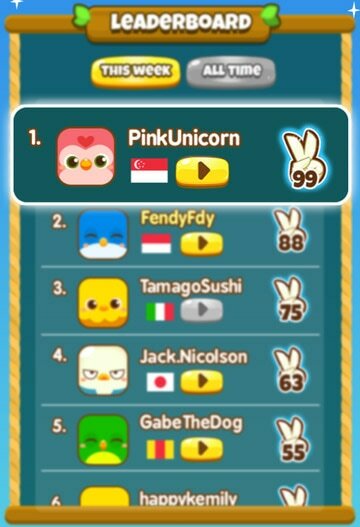 ​There are two leaderboards, current week and all-time. This week's leaderboard resets on every date/time of the week. The leaderboard ranks are based on your Win Streaks (the Peace sign to the right side of the display). The more win streaks you have, the higher your rank. Once you lose a PVP Battle, your current Win Streak will reset to 0. However, your highest win streak will remain on the leaderboard. These emoticons can only be unlocked with Win Streaks. When you reach Lv. 5, you will unlock the ability to customise Wave Attack patterns. What is a Wave Attack pattern? Whenever you do Chain Combos, you will automatically attack your rival by adding rows to their board. Those are wave attacks.​ This is indicated by the "[x] waves!!!" text in rival's board. ​A proper design can greatly slow down your opponent's playing speed and even cause them to overflow. ​Have fun designing your very own Attack Pattern! The default block patterns used in the new rows are shown here. You can customise your blocks any way you like. While some Blocks are provided free of charge, you can purchase more blocks to add on to your pattern. Simply tap on an existing Block in the customisation screen to move them into your inventory, at the bottom of the screen. In Inventory, tap on the block you want to use, then tap on the board to place them on the board. If you run out of Blocks, a "run out" text will appear. ​If you need more, you can buy more blocks with Feathers. The cost of each additional block is shown below your block quantity. ​Feathers can be used to unlock special equipments or buy new Wave Attack blocks. Feathers can be earned by leveling up, or completing a Battle. Training gives less Feathers than PVP. 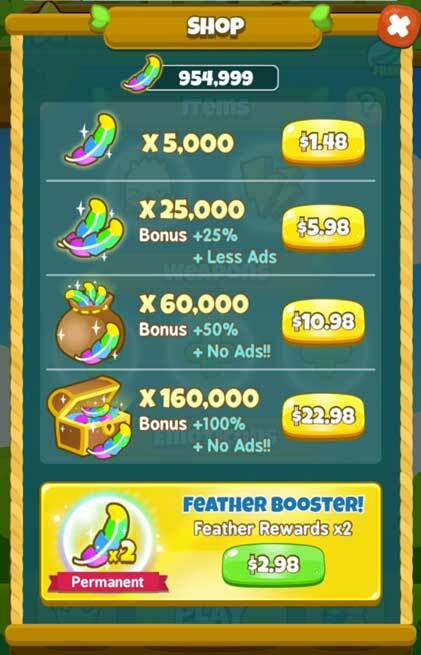 At the end of a Battle, you can also choose to watch a video ad (where available) to double your Feather earnings. There are several equipments in this game that can only be unlocked by using Feathers. These beautiful Feathers are the currency of Toriko. ​As you complete a Battle, EXP stars can also be earned to level up. 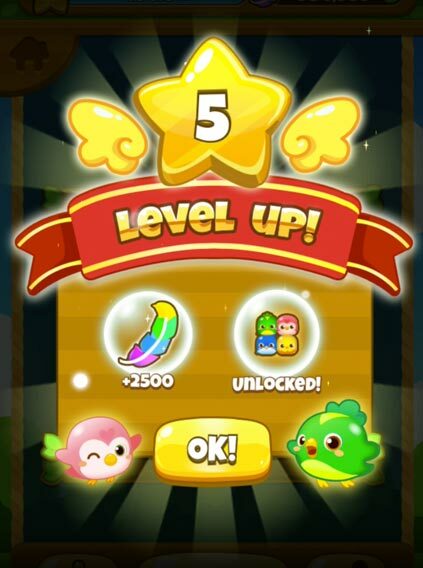 You can earn Feathers and unlock special equipments with each Level Up. There are several equipments in this game that can only be unlocked by leveling up. To access In-App Purchase (IAPs) screen, press the plus button at the side of your Feather currency.